Thank you for visiting Charlotte Limousine! We are a professional transportation company with a fleet of gorgeous limousines and entertaining limo buses at your service. When you work with us, you will find that not only do we offer top quality vehicles, but we put a focus on you, the customer, that can't be matched. There's nothing more rewarding than building a customer base that is truly satisfied and loyal. We love getting to know our customers on a personal basis as the years go by and as they call us time and time again for their special events. High school proms and graduations, then college graduations, then weddings and anniversaries, and then the cycle begins again with their children. This is a very rewarding business to be in, adding value to each and every one of your special days with beautiful and elegant transportation. Charlotte is a bustling city with a lot of character, and there is much to see and do here! You will have memories to last a lifetime when you explore the city from inside one of our limousines or limo buses. Not only are they great for enjoying Charlotte, but our limousines and limo buses are perfect for weddings, proms, birthdays, anniversaries, and more! We also offer Charlotte Party Bus service and also SUVs for airport service and corporate events. Virtually any event, personal or business related, can be bettered by the addition of an elegant limousine. The comfort that you experience when you travel with us is unparalleled, and you definitely impress your guests, whether they are your best friends or your coworkers! As you browse our website, you'll find information on our pricing policies, popular events and destinations, answers to frequently asked questions, and details about our vehicles. Please note that there are multiple tabs here on the main page where you can find out about our featured vehicles, our pricing policies, and our events! If you have any questions, just give us a call or email us! We have helpful reservation specialists standing by to give you any and all information that you need. We can't wait to work with you! This Lincoln Town Car Limousine can accommodate up to 8 passengers. Its classic black exterior is exactly what everyone imagines when they picture a limousine. It definitely won't disappoint! Our sleek white Lincoln Town Car Limousine can hold up to 14 passengers. It was custom built by the prestigious Krystal Enterprizes.Perfect for weddings and proms, you will have an unforgettable day in this limo! 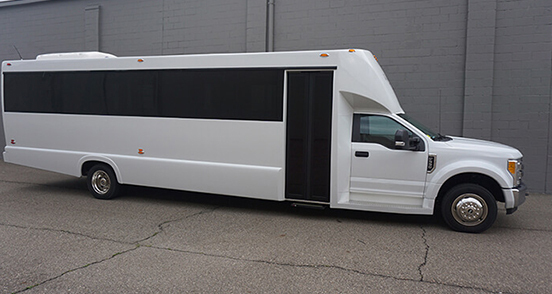 If you're ready for a wild night on the town with your friends, rent this limo bus immediately! It can seat up to 20 passengers on its custom leather perimeter seating. Have an unbelievable night with Limos Charlotte! Our gorgeous luxury Lincoln Navigator Executive Class can fit up to five passengers. It is perfect for airport service and transportation for important business contacts. Limos Charlotte offers pricing that competes with all other transportation companies in the Charlotte area, but that's not all! We also pride ourself in our customer oriented service. We keep you in the loop every step of the way, from your initial quote, right up until you step off the vehicle at the end of your trip. We are honest about our prices and policies, and we will never try to trick you with hidden fees or extra charges. We know that you will be happy with our prices and service. Just ask all of our repeat customers! Whether you're working with a tight budget or looking to pull out all the stops for a really luxurious night, we will do everything in our power to make your trip feel like it is worth a million bucks! We've got ways of saving you money even when it seems that there is no more money to be saved, and ways in which to make your trip even more VIP-worthy too! Where some companies shy away from encouraging price comparisons, we are so competitive with our pricing that we highly recommend checking around for a lower price, and if you find one, give us the chance to beat it! Sports fans love our limo buses and limousines! They are the perfect way to transport large groups without worrying about taking multiple vehicles or dealing with nightmare traffic and parking. If you arrive early, limo buses are perfect for tailgating! And you can celebrate your team's win the whole way home, chugging brewskis and living it up! There is a lot to see and do at night in the Charlotte area, and we want you to experience it all! Limos Charlotte offers convenient transportation and guarantees a safe way home at the end of the night. Don't worry about DUIs, designated drivers, and long waits for cabs. Party it up with ease! Your wedding bells are ringing, and Charlotte Limos wants to be around to hear them. Hire us for all of your wedding transportation needs. We will act as a shuttle, transportation for the entire wedding party, or just a special ride for the bride and groom. One wild night before you tie the knot! Head out with your buddies and hit up all the hottest bars and strip clubs that our area has to offer! Get crazy in the bus, sipping your favorite cocktails and playing bartender late into the evening. It'll be a night you'll never forget! There are so many options these days when it comes to bachelorette parties. There's something for everyone's style. Some just want a night of bar hopping, while others want to make a day of it, perhaps a spa day with visits to the salon and spa, or perhaps some shopping or even taking pole dancing classes! Some do a bridal shower instead of in addition! It might seem like a limo is just designed for fun times with friends, but they are so suitable for business events too. It's a wonderful way to impress clients and coworkers alike, and if you're traveling to a convention where parking can be a pain, this is a fantastic way to avoid that whole headache! Copyright © 2019 | www.limoscharlotte.com | All Rights Reserved.